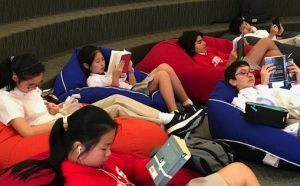 Books, Beans ‘n’ Bites: Monday, students enjoyed a quiet lunchtime read curled up on a beanbag in the library pit — the perfect way to relax in the middle of a hectic day! 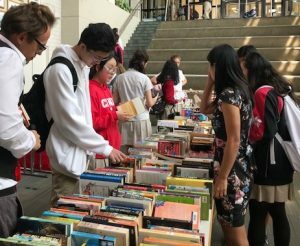 Book Swap: Tuesday, CISPA hosted their much anticipated annual Upper School Book Swap. Students and teachers took advantage of the opportunity to re-stock their bookshelves; they swapped and they shopped — recycling at its finest! With books on offer for just $10, it was a great day for bargain hunting bookworms! GDBA Awards: Wednesday, we met to discuss the Golden Dragon Book Award nominees in preparation for voting this month. You are eligible to vote in any category from which you have read at least two books. Voting closes March 31, so there’s still time to read a book or two and cast your vote for your favourite! 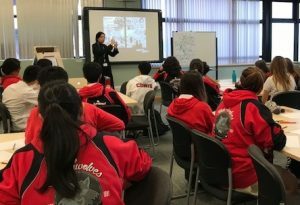 Author Visit: Thursday, the focus for grade nine students was on graphic novels, as they participated in workshops and a presentation by UK based author/illustrator Sonia Leong. 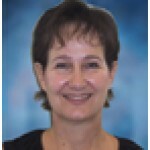 Sonia has won numerous awards for her work, including Young Adult Library Services Association “2008 Quick Picks for Reluctant Young Adult Readers” and “Best Books for Young Adults 2008” for Manga Shakespeare: Romeo and Juliet. 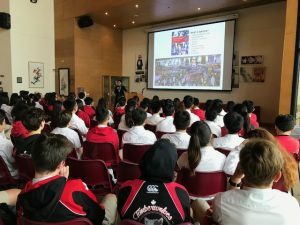 Her visit to CDNIS coincided with the culmination of the Grade 9 unit on that particular romantic tragedy. Not only did students gain a greater appreciation for the play itself, they also acquired insight into the graphic novel as a literary medium. Book Bee: Wrapping up our Spring into Reading celebration was this year’s Book Bee challenge! Students and teachers teamed up to compete in a test of literary knowledge — covering both the classics and contemporary YA fiction. Following an extremely tight race among all teams, the final result was a tie between Boneless Pizza and the Wiley Wonkas! Thanks to all who took part in the fun and congratulations to the winners! Thanks also to Ms. J., our quiz mistress extraordinaire! Cast your vote for your favourite photo!